Universal 1¼" T-Adapter #93640. Similar to #93625 but in addition includes an integral 2x barlow lens which can be used visually or photographically. 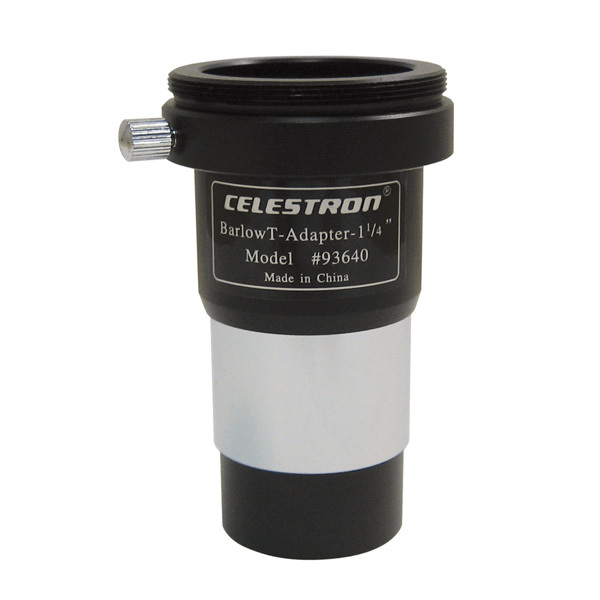 A T-Adapter allows you to attach your 35mm SLR camera to the prime focus of your telescope or spotting scope. This arrangement is used for terrestrial photography and short exposure lunar and planetary photography. It can also be used for long exposure deep-sky photography when using a separate guidescope. Both a T-Adapter (this item) and T-Ring (not included) are required to mount a 35mm SLR camera to your instrument. You can also insert standard 1.25" eyepieces into the barlow tube and use it as a conventional 2x barlow. (iii) Attach standard 1.25" filters between the tube and the barlow element (you cannot attach filters to the bottom of the barlow element). Weight = 2.4oz; Length = 2.91" (74mm); Clear aperture = 0.87" (22mm); Includes 2 end caps; Made in China.